I.O.O.F. Hall in Covington (Gone). Organization-Original and Present Area-Drainage and Physical Features-Population-Early Settlers-Early and Later Enterprises-Schools-Postmasters and Justices-Churches, Cemeteries and Societies. Covington township was organized in February, 1815, and was taken from Tioga township. Its original boundaries included the township of Richmond, the southern portion of Rutland, all of Sullivan, Ward, Union, Hamilton and Bloss, the greater part of Liberty and the borough of Blossburg. As at present constituted it is about eight and a quarter miles from east to west, by four and a half from north to south, and contains about thirty-seven square miles. The Tioga river crosses its southern boundary line, about a mile and a quarter east of the center , and pursues a slightly winding course almost due north through the township. About one-third of the area of the township lies to the east and two-thirds to the west of the river. The tributaries of the river within the township are Barber run, which flows from the east and unites with it within the Covington borough limits; Marvin, or Copp Hollow run as it is also called, which flows from the west, and unites with it above the borough; Howland run and Elk run, both of which flow from west, the confluence of the former being within the borough limits and of the latter near the northern boundary line of the township. Canoe Camp creek pursues a northwest course through the northwest course through the northeastern part of the township, and East creek a southwestern course through the southeastern part of the township. The entire township is hilly, the southern portion especially being rugged and rocky. North, however, of the mouth of Marvin run, the hills assume a gentler slope, and are, as a rule, under cultivation. Here and there a place too steep for ploughing is found, and is used as a sheep range. Richly fertile and well-cultivated farms are to be found along the river and in the valleys of the creeks. The forests of pine and hemlock which taxed the energies of the early pioneers have disappeared except in isolated areas of a few acres. So long as they lasted they furnished employments for lumbermen and for saw-mills, the last of which disappeared from the township years ago. Covington is now one of the best agricultural townships in the county. Its growth has been constant, and its material prosperity has kept pace with its increase in population. In 1870 it had 811 inhabitants; in 1880, 1,134; and in 1890, 1,123.
repose in the cemetery south of Covington borough, The next to settle was David Clemons, who located three miles south of Covington borough, near the southern line of the township, on the farm now owned by W.J. Richards. He came from Vermont in 1806,and was the first person to mine Blossburg coal for shipment, hauling an occasional load overland to Painted Post. Aaron Gillett, who settled in Tioga township in 1798, removed to Cherry Flats about 1804. L.L. Washburn, now a resident of Roaring Branch, says his father cleared the land at Cherry Flats, before 1806, on which Levi Elliott, who came into the township in 1808, settled in 1812. Elijah Putnam, a native of Worcester county, Massachusetts, came from Langdon, Cheshire county, Massachusetts, in 1809 , and settled east of the borough, on the farm now owned by John Cleveland. Asahel Graves came in 1811, from Peru, Bennington county , Vermont, and settled on the on Elk Run. Tilly Marvin came in 1817 from New Hampshire and settled on the west side of the river, near the mouth of Marvin creek. He was four times married, and was the father of twenty-four children. About 1825 Ephraim B. Gerould, a native of Newtown, Connecticut, settled just east of the borough. Among other early settlers were John Copp, who located in “Copp Hollow,” west of the Tilly Marvin; Alonzo Reddington, James Pettis, Jonathan Jennings, ISAAC Bliss and Abraham Johnson, who settled on Elk run. Mr. Bliss was the father of P. P. Bliss, the celebrated evangelist, who lost his life in the railroad disaster at Ashtabula, Ohio, December 30, 1876. The early settlers along the State road were Norman Rockwell and Avery Gillett. John Jaquish settled on Canoe Camp creek, near the Richmond township line , in 1828, on the farm now owned by his son , Charles Jaquish. About 1830 Lyman and Calvin Frost settled on Canoe Camp creek, east of Covington borough. Their brothers, Samuel, James and Elias, came later. These five brothers were the founders of the “ Frost Settlement.” They have left numerous descendents. After 1830 the township filled up rapidly, the valleys of the river and creeks being the first to be cleared and cultivated. In 1822 Daniel Harkness erected a distillery on the hillside east of the Glass Works. This he appears to have disposed of a year later to Isaac Walker, Jr. It was discontinued in 1826. In 1824 Daniel Harkness erected a grist-mill on the Tioga river , south of the borough limits. In 1834 the mill was transferred to James Husted, who operated it until 1837, when it became the property of Isaac Baker, who was succeeded by Israel L. Wells in 1840, who ran it until 1842, when it became the property of Joseph Hubbell. It was burned soon afterward, and on its site Mr. Hubbell erected a large three story mill. This mill was afterwards operated by U.S. Diffenbaugh and by Evans and Brown. It was also destroyed by fire. In 1873 the present mill, which is operated by C.F. King, was erected, on a site near the old mills. It is a water-power mill, devoted to custom grinding. A sash factory was erected in 1834, near the grist-mill, by William Hagenbach. In 1836 he disposed of it to George C. Kress. In 1837 a saw-mill was erected and operated in connection with the factory. It is related that the sash made in this factory were hauled overland to Pine creek, and rafted down stream to Williamsport and below. This was in addition to shipments by railroad into southern New York. In 1846 the enterprise was assessed to Weatherbee & Kress, who carried it on until 1848, when D.S. & W.H. Ireland became the owners. A year later D.S. Ireland became the sole owner and carried it on for a number of years. In 1837 Lyman Frost erected a saw- mill on Canoe Camp creek, in the “Frost Settlement.” This he operated for a number of years. In 1839 Boyd and Cleaver erected a saw-mill near the mouth of Elk run. In this mill oak plank, seventy to eighty feet in length, for use in building canal boats, were sawed. After Mr. Boyd’s death, in 1842, the mill became the property of Edwin Dyer. He ran it until 1848, when it was turned into a tannery, operated by Edward Milliken and Nathan Gitchell. It was destroyed by fire about 1851.In 1839 Asahel Culver built a saw-mill on Elk run, just below Cherry Flats, and in 1841 erected a grist-mill. These mills were sold to Joel Beebe, who ran the grist-mill until about 1853 and the saw-mill until 1862 or 1863. In 1843 Joseph Jaquish erected a saw-mill on Canoe Camp creek , near the Richmond township line. This he ran for several years. Levi Elliott and his sons, N.A. and Levi H. Elliott, built a saw-mill at Cherry Flats, which they ran for about ten years. The “ Elk Horn mill” was erected on Elk run, on the Rockwell place, about 1847, by Francis Weatherbee, Benjamin Kress and Orrin Day Weeks. It was operated until about 1870. About 1854 a saw-mill was erected just above the Edwin Klock place, by Abraham Johnson and Thomas Goodenow. It was operated for a number of years. In 1852 Irving Harkness established a tannery at Cherry Flats, which he operated until 1854. The Covington Glass Works were erected in 1850 by David Hurlbut, south of the borough. After being operated by many owners , they passed into the control of Hirsch, Ely, & Company, of Blossburg, about 1880, and were carried on by them for about ten years. For the past five years the works have been operated by a company composed of citizens of Covington. A fine quality of window glass is manufactured , and employment given to about fifty persons. Previous to the enactment of the public-school law in 1835, the schools of the township were supported by subscription. The first school houses were log structures, crude in construction and primitive in appointments. Among the earliest were those erected in the Frost Settlement, in Copp Hollow, a Cherry Flats and at West Covington. After the public school law went into effect the township was divided into districts, and a better class of school houses erected. As the township increased in population the original districts were sub-divided, until in 1896 there were thirteen districts, in which school is maintained during six months of the year. Good teachers, generally graduates of the State Normal School at Mansfield, are employed, and good wages paid. The schools rank among the best public schools of the county. The post office of West Covington, the only one in the township, was established in 1869. Edwin Klock was postmaster until July, 1875, when Francis Kelly. the present incumbent, was appointed. The office is located in Elk Run valley, two miles and a half northeast of Cherry Flats, on the stage route between Wellsboro and Mansfield. Graves, 1851; Richard Videan, 1852; N.A. Elliott, 1856; James T. Frost, 1859; N.A. Elliott, 1961; S. F. Richards,1864; re-elected, 1875;Silas S. Rockwell, 1866; H.G. Martin, 1867; re-elected 1872, 1877, 1882; Joseph Whiting, 1869; S.C. Watkins, 1882; re-elected 1887; J. B. Ford, 1887; re-elected, 1893; Charles Jaquish, 1890. The First Methodist Episcopal Church of Cherry Flats originated in a class formed about 30 years ago. On June 9, 1877, the society was incorporated , the incorporators being D.G. Edwards, S.H. Wood, Thomas R. Bowen, George Cramer and H.G. Martin. 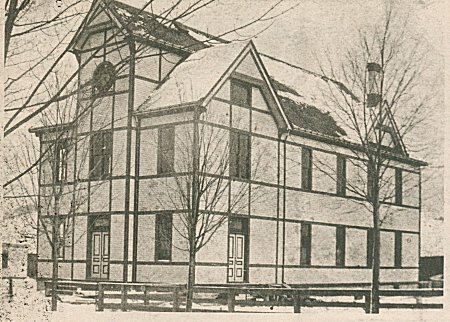 In 1878 the present church building was completed and dedicate. The church has been in the East Charleston charge since its organization and is served by the pastors of the church at East Charleston, or Whitneyville. It maintains a well attended Sunday-school and has a large membership. The Second Adventist Church owns a neat building in Cherry Flats. The members are residents of the western part of Covington and the eastern part of Charleston. A Sunday-school is also maintained. Adjoining the church is a cemetery. The Covington Cemetery, just south of the borough, is the resting place of the early settlers of the borough and vicinity. The first interments were made here about 1835. Here reposes the remains of Aaron Bloss and Ruah ( Lownsbury) Bloss, his wife, of Isaac Walker, Ephraim B. Gould and other early settlers. The Gray Cemetery was established in 1881, on the Victor Gray place, west of the river. The first body buried here was that of Charles Gray, a son of the owner of the ground. This cemetery is neatly fenced and well taken care of. The cemetery on the Lewis farm, on Elk run, has been used as a burial place for many years. It is about a half mile east of West Covington. The remains of a number of the early settlers of the Elk Run valley are buried here. Societies-- Covington Borough Grange No. 1016, P. of H., was organized March 7, 1891, and now numbers twenty- seven members. It met in Covington borough until December, 1894, when the place of the meeting was changed to the residence of Bradley Wilkins, near West Covington. There is also a large and prosperous grange in the Frost Settlement.